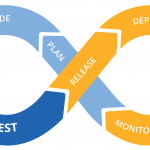 A key consideration when building Test Environment Management solutions is to both understand and promote the DevOps philosophy of Continuous Integration and Continuous Delivery (CICD). A philosophy or practice that promotes the rapid merging of developer artifacts (which could cross Application Software, the Data and the Infrastructure) and ensuring continual and automated build, testing, packaging and deployment). + Early identification of defects. In today’s vast software market there is a plethora of CICD & TEM tools to consider and choose from. Some of which do one specific task (e.g. system deployment e.g. Atlassian Bamboo) and others which help govern the complete IT life-cycle across the enterprise (promoting SAFe or “Agile at Scale” objectives, for example enov8 Environment Manager). Looking for some ideas on the best tools to help you in the complex world of CICD (Continuous Integration and Contininuous Delivery) then visit Guru99’s latest Top 20 list for CICD.